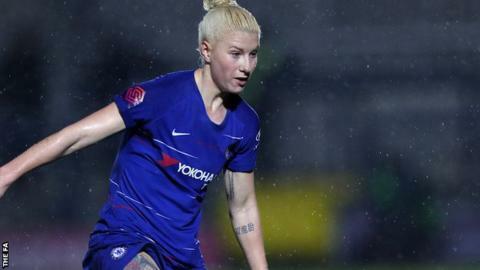 Chelsea forward Bethany England has signed a new contract with the Women's Super League club until 2021. The 24-year-old, who arrived from Doncaster Rovers Belles in 2016, is the Blues' top scorer this term, with 17 goals in all competitions. "I'm delighted to finally sign the two-year-deal," she told Chelsea's website. "I want to keep improving on a personal level, keep scoring and hopefully I can really cement my place in the team and hopefully get that England call-up." Chelsea face French side Paris St-Germain over two legs in the Women's Champions League quarter-finals in March.